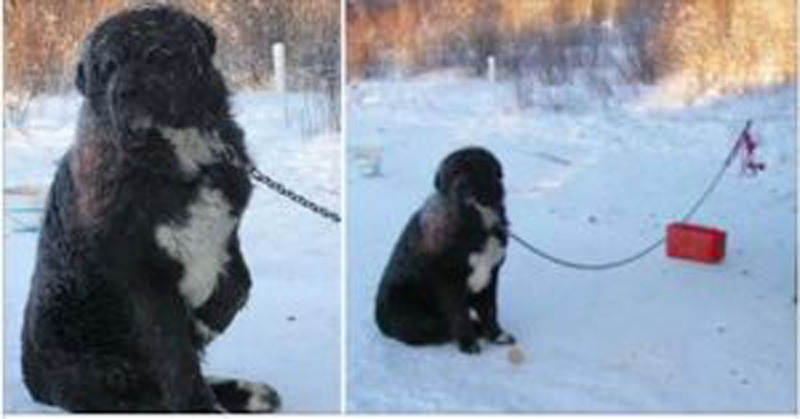 Home » life » Abused Dog Is Chained Outside In Freezing Cold. But Years Later, Rescuers Finally Show Up. Abused Dog Is Chained Outside In Freezing Cold. But Years Later, Rescuers Finally Show Up. While it’s imperative to focus on the positive in life and to be appreciative of what great things you have, it’s also important that we’re aware of what’s going on around us. So often, people live life with wool over their eyes in an attempt to block out the negative things that they just don’t wish to know. This article brings to light the huge problem that is animal abuse—but don’t worry, there is a happy ending to this particular story. It’s a story about a non-profit organisation called Animal Advocates who have done some tremendous work in Canada. They aim to give abused and unhappy dogs a new forever home so that they may receive all the love and attention that they truly deserve. This story is about a dog named Diesel. Diesel is an adorable pup that lived in harsh conditions for four years. He was chained outside—despite the cold weather that would sometimes reach less than minus 40 degrees celsius—kicked in the face which resulted in him losing his teeth and splitting his tongue, and had a coat that was stained with blood from fighting with another dog. Luckily, Animal Advocates stepped in and changed Diesel’s life. They flew him out from Yukon where he resided, and sent him straight to the vet. It was here that they successfully removed a tumour no one knew Diesel had. And after he had recovered, he was able to engage in hugs, playing, and fun. He was a shy pup at first, but after a few weeks, he was extremely friendly and loving—and it’s all thanks to this selfless animal rescue organisation. Watch the video below to learn the full story of Diesel, other dogs who have been rescued, and those who still need help. And don’t forget to share it with your family and friends.